The Oceanic Systems' Primary Poseidon Display provides an elegant and modern presentation of all vessel control and monitoring systems. 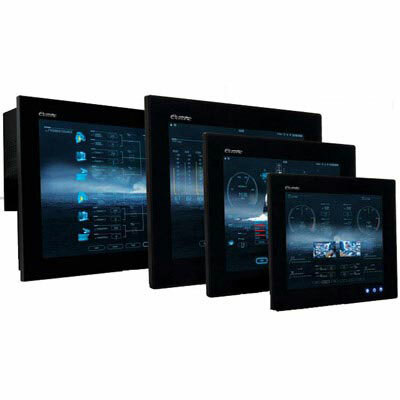 Poseidon supports up to 2 primary helm displays and up to 8 secondary displays elsewhere in the vessel across the network, all available from Oceanic Systems as BlackGlass™ high resolution touchscreen displays. Available in sizes ranging from 10" to 21.5", these displays add pure class wherever they are installed. Using capacitive touch, sunlight readability and night vision settings, these displays are continuously vibrant and beautiful. The Primary Display is designed to work in perfect unison with the 5180 Poseidon System Unit, providing real time data in stunning vector graphics. Poseidon is a fully customizable system, allowing you to choose what you see, and the options are limitless. Change the background of your displays, move, add and delete controls. The Poseidon® library provides a wide range of pre-installed options to get you going. The system uses drag and drop technology, ensuring simple user configuration throughout. The wide array of Poseidon's options unite style and function, constantly evolving to meet the user's requirements.